Available at our Caloocan, Cubao, Pasay, Earnshaw, Kamias, Baguio, Olongapo, and Dagupan terminals. The card can be loaded at major Victory Liner stations and at Metrobank Card partners (SM, Robinsons, National Bookstore, Family Mart, and EC Pay Partners). Book and buy your bus ticket over the phone by calling #MYVLI (#69854). This is a privilege that only our Premiere Cardholders can enjoy. Hurry Get one now. Enjoy a special VIP lane when buying tickets at any Victory Liner station. Reserve and buy Victory Liner tickets over the phone via our (02) 842-8679 hotline. Send or receive money transfers and withdraw at any BancNet ATMs nationwide. Zoomanity group will give Twenty thousand (20,000) tickets FREE RIDE good for two (2) person (No expiry) on all Victory Liner Premiere card Holders upon purchase of the card. Victory Liner Premiere Card holders can avail Ten percent (10%) discount on accommodation at WIN HOTEL. *Victory Liner Premiere Card holders must present card upon check-in. Victory Liner Premiere Card holders can avail Ten percent (10%) discount on accommodation at CASA ANGELINA base on normal rates on any overnight stay for all the cards holders. *Victory Liner Premiere Card holders must present card upon registration. Victory Liner Premiere Card holders can avail Ten percent (10%) discount on total food consumption base on the rack rates. Victory Liner Premiere Card holders can avail One (1) free entre’ once they order at least five (5) dish. The cheapest among the five (5) will be FREE. Victory Liner Premiere Card holders can avail the weekly promo of the restaurant. Victory Liner Premiere Card holds can avail 10% percent discount on OCEAN ADVENTURE park admission – base on the rack rate. *Special park admission rate is extended up to three (3) companions. *Pre-booking is required for all encounters. *Promo is not applicable on weekends, long weekends, holidays, special occasions, special events, peak season and peak-of-the-peak season. Victory Liner Premiere Card Holders can avail the Ten percent (10%) discount on day tour beach entrance. Victory Liner Premiere Card Holders can avail the Five percent (5%) discount on Food and Drinks - total food and drink consumption, just present the Card upon billing. Victory Liner Premiere Card holders can avail Five percent (5%) discount on White Rock Hotel accommodation – on Best Available rates. *Victory Liner Premiere Card holder must present the card upon Check In – valid for Individual discount only (One card per one person). 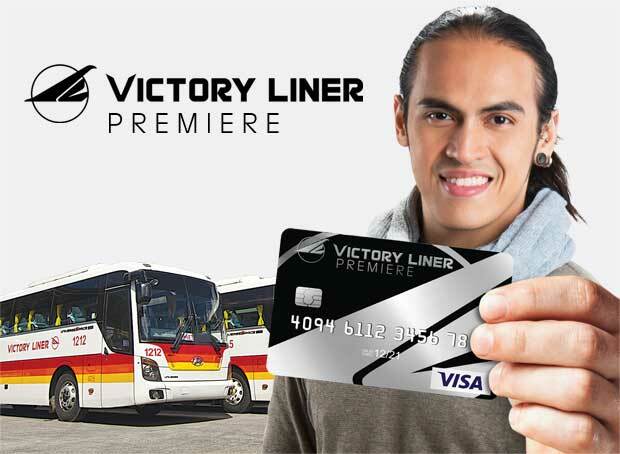 Victory Liner Premiere Card privileges and discount is Non – Transferable. Victory Liner Premiere Card holds can avail the 30% percent discount for the SPRAY (4hrs) or SOAKED (8hrs) experience INFLATABLE ISLAND on weekdays only. Victory Liner Employees can also avail the privilege discount up to Thirty percent (30%) discount on INFLATABLE ISLAND on weekdays only. *Victory Liner Premiere Card holders must present card upon registration. Check In or upon Billing. Victory Liner Premiere Card holders can avail Five percent (5%) discount in Zen hotel cafe and Solido restaurant. Victory Liner Premiere Card holders can avail Ten percent (10%) discount on CAMAYAN BEACH RESORT & HOTEL beach admission – based on rack rate. *Special Beach Admission rate is extended up to 3 companions. *Superior and Deluxe room only with Breakfast for two (2) person extra person will be charge: Adult – Php 1, 00.00 with Breakfast, Child – Php 350.00 with breakfast. Victory Liner Premiere Card holders can avail Thirty percent (30%) discount on MAGAUL BIRD PARK at JEST CAMP. Victory Liner Premiere Card holders can also avail the Ten percent (10%) discount for Birthday celebrant just present valid ID with birthday indicated. Victory Liner Premiere Card holders can avail Five percent (5%) discount on total food consumption base on the rack rates at Café by the Ruins Baguio. Victory Liner Premiere Card holders can avail Twenty percent (20%) discount at TREASURES OF BOLINAO on all services. *Victory Liner Premier Card holders must present card upon check-in and or upon using the privileges / discount card. Victory Liner Premiere Card holders can avail Twenty percent (20%) discount at POTIPOT GATEWAY RESORT on all services. Victory Liner Premiere Card holders can avail Ten percent (10%) discount on TRYP by Wyndham Mall of Asia - on Best Available rates. *Victory Liner Premiere Card holders must present card upon registration Check In or upon Billing. Victory Liner Premiere Card holders can avail Ten percent (10%) discount on all Microtel Inn and Suites By Wyndham – on Best Available rates. Calling all our Premiere Cardholders, present your membership card at KidZania Manila Counters to GET 20% OFF YOUR Kidzania Manila Tickets!